THE fight to the death between the rich diversity of Borneo's tropical rainforest and the money and jobs created by oil palm plantations is starkly apparent at Malaysia's Similajau National Park. 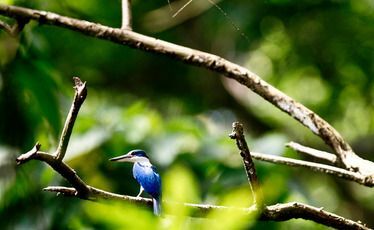 One side of the broad, brown Similajau River is a forest which provides a home for 185 species of birds plus everything from crocodiles and monitor lizards to monkeys and mouse deer. On the other side of the river, the forest is making way for more hectares of oil palms which are one of the main sources of income in this part of the world. As we cruised into the river mouth in zodiacs from the expedition ship Orion II, which was anchored out in the South China Sea, the battle for the land between parks and plantations was immediately obvious. A great cloud of smoke drifted across the land as what looked like an enormous fire raged close to where we were heading. Mick Fogg, our expedition leader for a cruise around Borneo, had told us beforehand that jungle like the forest which lined the banks on the right-hand side was being cleared at a rate of 400sq m a second. Now it seemed we were going to get an unwanted demonstration of the clearance process. For the time being at least, some jungle was surviving. We had barely entered the river when we got an indication of the amazing birdlife, first spotting the brilliant orange and blue of a big stork-billed kingfisher, then the smaller but almost equally spectacular blue-throated kingfisher. And, immediately afterwards, we struck the opposing forces in the shape of a burned patch of forest on the park side of the river. "This is what happens," said our guide Mark Watson. "They 'accidentally' burn a chunk of the park and then argue that it's already spoiled so it might as well be cleared and planted in oil palms." It was pretty clear that the forces of development were triumphing in this corner of Borneo. As we journeyed up river, we frequently spotted plantations lurking behind a narrow fringe of forest cover. And when we reached the local village where rows of small boats lined the banks below a string of dilapidated homes seemingly cobbled together from bits of scrap, a bulldozer was busy clearing more land for planting. But it wasn't all bad news as we continued to spot interesting birds, including a blue-throated bee-eater, several sandpipers, the familiar white shape of a cattle egret, a grey-headed fish eagle and a serpent eagle. On the banks, we saw a big monitor lizard looking for food and a boat ahead of us reported seeing a long-tailed macaque. The presence of monkeys was also indicated by a couple of partly-eaten red and yellow pandanus fruits and a scattering of pink flowers. Our main objective in making this cruise was to try to spot some of the many kinds of hornbill - magnificent birds with massive beaks - found in the park. At first they were hard to find - a black hornbill in the distance caused the only flutter of excitement - but, as dusk approached, they came out to feed. Even Mark's expert eye couldn't identify them all in the fading light but he did pick several oriental pied hornbills, a black hornbill and a squadron of wrinkled hornbills. Mark was almost beside himself with excitement. "There's another one. And another. It's amazing. I've never seen anything like it." Altogether we counted up 15 wrinkled hornbills flying across the river just in front of us. It was a dramatic culmination to our zodiac expedition. But as we made our way back to the ship, the forces of the palm oil industry had a spectacular last word. The smoke from the forest fires created a stunning sunset, setting the sky over the South China Sea ablaze and providing an amazing backdrop for our waiting ship.